The Scheme aims at improving participation of ST children in classes IX and X of the Pre Matric stage, so that they perform better and have a better chance of progressing to the Post Matric stage of education. The rates of Scholarship are Rs.150/- per month for day scholars and Rs.350/- per month for hostellers, for a period of 10 months in a year and books and ad hoc grant of Rs.750/- per year for day scholars and Rs.1000/- per year for hostellers. Additional allowance for ST students with disabilities is also admissible to those students who are studying in private unaided recognized schools. The scholarship is, however, available to only those ST students who are not getting any other Centrally funded Pre-Matric Scholarship and whose parents’/guardian’s annual income does not exceed Rs.2.00 lakh. The Scheme is implemented through the State Governments and UT Administrations who receive 100% Central Assistance over and above the committed liability of the State Governments/UT Administrations. Register yourself on National Scholarship Portal (http://scholarships.gov.in/) by clicking on ‘Register Here’ link as shown in screen below. Once registered, system will generate a unique Application id in the format KA201718XXXXXXXXX. This Application id and password will also be sent to your registered mobile number as text message. 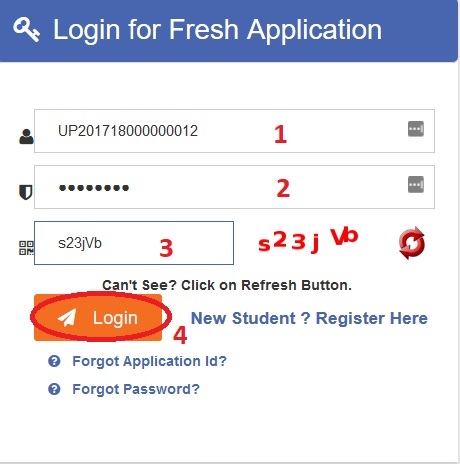 Use the Application id and password to login on NSP 2.0 portal. Upon successful login, change the password and save it for future use. You will then be directed to a customized dashboard where you will be able to apply for Scholarship Schemes of you state. In the dashboard, apply for Scholarship Scheme by clicking on ‘Application form’ link or ‘Apply’ button as shown in the screen below. 2. Students are advised to submit only “One Application Form”. In case if students submits more than one application form then all the applications submitted by students will be considered as “Duplicate” and will be “Rejected”. 3. Students are advised to provide “Annual Family Income” as per the Income Certificate issued by competent authority in their scholarship application.